Beardie just laying in his hide spot • Bearded Dragon . org . Its 6th day of december and normally bearded dragons starts brumation and start that long good sleep. But my bearded dragon is like 5 months old and hes acting weird. When i wake up at 7-8am i put UVB and basking light on for him. Then i eat breakfast and check if hes out of his hiding/sleeping spot and hes not. I have to get him out to basking spot every morning so he can get some heat to his body. Then he might eat a cricket or couple mealworms when hes done basking. 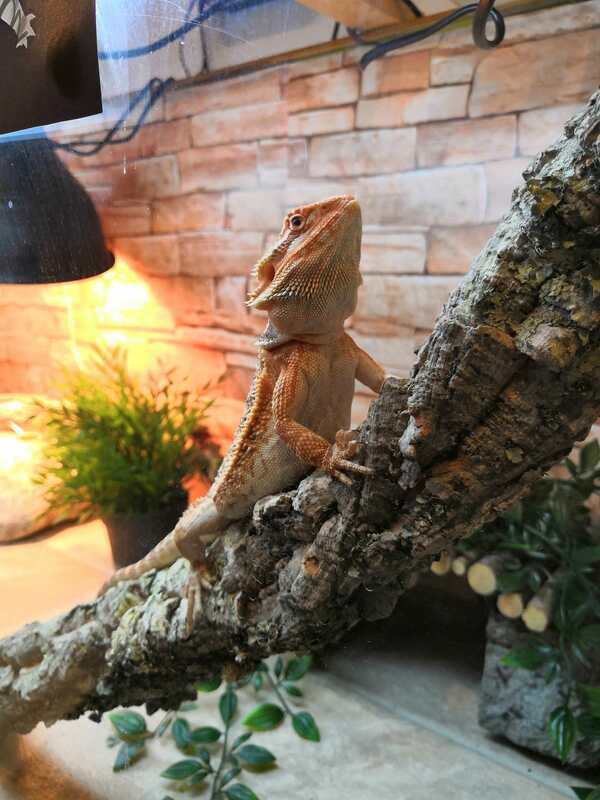 Then comes the weird thing (keep in mind that this is my first beardie so i dont have experience from a whole year cycle how things go) he might get some UVB on him and chill for couple minutes then hes off to his hiding spot. But hes not sleeping? He just lays there eyes open doing really nothing. He is responsive for example he follows my finger when im trying to get his attention. I get him out from his hiding spot for like 3 times a day to under basking spot. Cycle wich im currently using for him is 12/12hrs. Month ago he still ate crickets like 3-10 a day and bunch of mealworms. Hes really bad when it comes to veggies/fruits. Been trying to feed him carrot,summer squash,pea sprouts, arugula and basil. I have done my research and if im not mistaken every answer directs to brumation. I want to be sure about this because he is still eating some, after basking and eating he lays on his hiding spot, eyes open. What kind of set-up do you have? Temps? Has he been getting calcium? It could be brumation...they can do so at that age. I'm going to demure to someone who has more experience as my beardies never really seem to brumate. My current beardie, Charlie, has had less active times, but has not brumated (he's almost 2 years old). NBGwen wrote: What kind of set-up do you have? Temps? Has he been getting calcium? It could be brumation...they can do so at that age. I'm going to demure to someone who has more experience as my beardies never really seem to brumate. My current beardie, Charlie, has had less active times, but has not brumated (he's almost 2 years old). 130x45x55cm terrarium. Temps are approx 38-41C in basking spot and in his hide spot its around 22-24C. He gets most of his mealworms served in calciumpowder. Today he did eat 12 mealworms. Last month 24th day hes weight was 126grams, havent checked it this month since i do it once a month. Is there another type of feeder you could give him available to you locally? Mealworms have a hard chitin layer (outer shell like skin) which is harder for beardies to digest. Depending on where you are, crickets, hornworms, silkworms (one of the highest nutrient ones), BSFL (black soldier fly larvae - another nutrient dense feeder), superworms and even roaches are a far better option (I'm in Canada so can't speak on the roaches though as they are illegal here, no joke). I'm thinking he's probably a big bunged up from the mealworms which would inhibit his behaviour. Temps look great, enclosure is ok until he gets bigger - what about UV? In order to properly absorb the calcium, they need UV something like this - https://www.amazon.ca/dp/B00AQU8HAO/?coliid=I3N83XB43Q62E8&colid=2QCV4TGDIJ96T&psc=0&ref_=lv_ov_lig_dp_it is best (coil ones aren't so great). NBGwen wrote: Is there another type of feeder you could give him available to you locally? Mealworms have a hard chitin layer (outer shell like skin) which is harder for beardies to digest. Depending on where you are, crickets, hornworms, silkworms (one of the highest nutrient ones), BSFL (black soldier fly larvae - another nutrient dense feeder), superworms and even roaches are a far better option (I'm in Canada so can't speak on the roaches though as they are illegal here, no joke). I do have some roaches but he rarely eats them.. yesterday he ate one small roach. I have 2 similiar UV lights like in your amazon link. 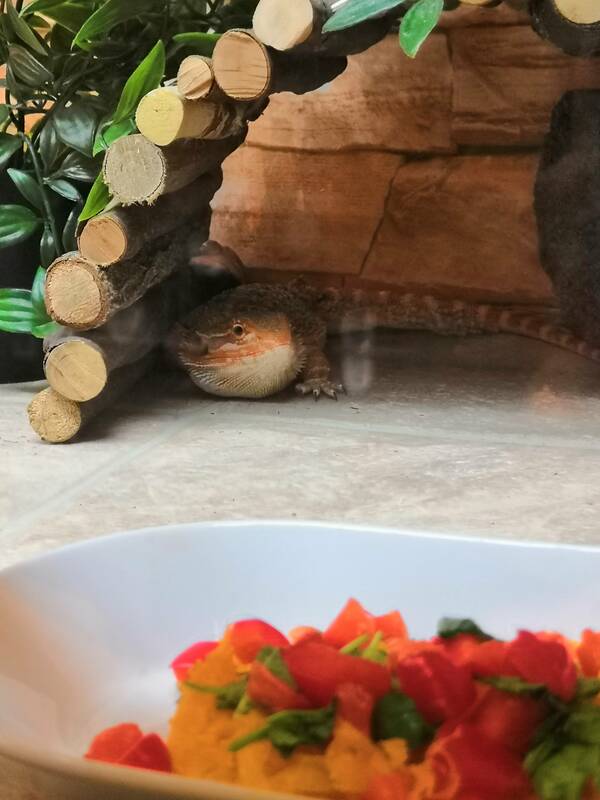 Like a month ago he still ate lots of crickets.. i think he got bored of that diet. He also very rarely eats veggies or salad wich bothers me. Mealworms is the only thing he mainly eats at the moment. hmmm...my Charlie will only eat (regularly) superworms and hornworms. He sometimes will eat butterworms, but turns his nose to everything else. I've tried silks and BSFL,nope. He'll only eat baby bok choy too...no idea why. I've tried feeding him everything under the sun and he ignores it all except for bok choy. Basically, what I'm saying is that beardies in their diet choses can be little fussy little toddlers. If they decide they don't like something - they won't eat it. The only thing I can think of is to try him with a feeder insect he hasn't tried. I would try to first to see if he'll eat BSFL - they are so nutrient dense, small, and so easy to keep. They are cheap around here - not sure about Finland. I tried googling options, but I keep getting links for edible insects for humans LOL! NBGwen wrote: hmmm...my Charlie will only eat (regularly) superworms and hornworms. He sometimes will eat butterworms, but turns his nose to everything else. I've tried silks and BSFL,nope. He'll only eat baby bok choy too...no idea why. I've tried feeding him everything under the sun and he ignores it all except for bok choy. Basically, what I'm saying is that beardies in their diet choses can be little fussy little toddlers. If they decide they don't like something - they won't eat it. Yeah i have to google something better than mealworms for him. He needs something wich has protein. I think mealworms doesnt have that much of it. Whats BSFL? Today my beardie had a lazy morning and didnt want to come from his hiding spot to baskin one. At the morning i moved him under it and after a while he got energy to run around his terrarium and my living room. But its only one out of three days he does this, other days he just lays in his hiding spot.. Could it just be brumation? Its this time a year anyway.. Hes energic when he wants to lol. Black Soldier Fly Larvae - https://www.animalsathome.ca/bsfl-best-feeder-insects/; they are also called Phoenix worms. Charlie won't touch them, but if you can get your beardie to eat them they are pretty much the best feeder our there in terms of nutrients, them and silkworms. NBGwen wrote: Black Soldier Fly Larvae - https://www.animalsathome.ca/bsfl-best-feeder-insects/; they are also called Phoenix worms. Charlie won't touch them, but if you can get your beardie to eat them they are pretty much the best feeder our there in terms of nutrients, them and silkworms. Oh those, i dont think i cant get those from anywhere.. Also dont know where i can order them and get a delivery to Finland. Hmm, he really needs some different feeders wich has calcium and protein. At the moment, he just chilling in his hiding spot. Did you ever figure out what was going on? Or did he ever bounce out of it?